This March 17th, as it has been since the early 1600s, is St. Patrick’s Day. St. Patrick is the patron saint of Ireland, and it is actually a public holiday in the Irish Republic. St. Patrick’s Day is the day of the patron’s saint’s death. The day is celebrated by wearing green, drinking beer, and, in pretty much every country, having a parade. It is most often associated with luck and gold coins, yet you should leave the luck to the parades. When it comes to your future, you don’t want to take any chances. Your pot of gold is a well-crafted estate plan; here’s why. One place where you don’t want to test your luck is sickness. Illness can creep up on anyone, and it’s important that you don’t let it catch you unawares. Consider obtaining a healthcare directive and power of attorney. A healthcare directive is a set of instructions that you submit to the hospital ahead of time. In case you’re too sick to tell the doctors yourself, they will go by the instructions you leave them. This works well if you have special needs or religious views that you want respected. A power of attorney helps you manage your healthcare and/or financial decisions when you’re too unwell to do it yourself. You selected a trusted individual to be in charge of the decision. This individual should know you well, and they should respect your decisions and know what you want. This position is vital, and it takes a lot of consideration. When you’re healthy, you might feel tempted to test your luck. After all, you don’t see sickness or anything on the horizon. What’s the worst that can happen? As everyone knows, that question is a loaded one. When you’re healthy, you can get a lot done with regards to your estate plan. You can include directions on transfers of assets, medical care, creditor repayment, and more. Seize the day when you are healthy to prepare for when you are not. Probate court is where your assets go when you don’t leave instructions on what to do with them. Even a last will and testament is subject to probate court. A way out of it is to set your assets up in a living trust, which will nominally take effect once it is signed. This way, your assets go to your beneficiary (via your trustee) without sticking them in probate. Probate court wraps up estates by paying off debts first and then splitting the remains. It also takes a long time, and it is very expensive. It is not something you want to put your family through, to say the least. And by “gold,” we don’t mean shiny metal. Your home, car, furniture, collectibles, etc. ; everything you own is an asset. You want to protect these from probate court and keep them in the hands of the people you love. You can do this by working out a well-crafted estate plan. Safeguarding your treasure is a matter of good estate planning. If you have kids, you will want to make sure that someone is there to take care of them if you’re unable to do so. You can include guardianship in your estate plan. The guardian you choose should be one who is, obviously, responsible and who consents to become the guardian. Luck is best left to the Irish, and St. Patrick’s Day is a fun time every year. However, don’t get swept up in the fervor and think you’re untouchable. 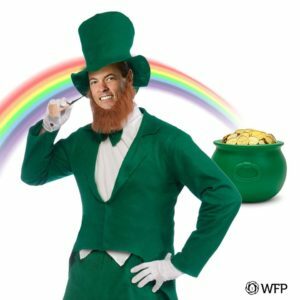 It’s time to craft an estate plan that will be better than anything a leprechaun can offer. There’s a way to structure your future that protects yourself, your family, and your assets without cutting corners. It is best to contact an estate planning attorney for assistance.